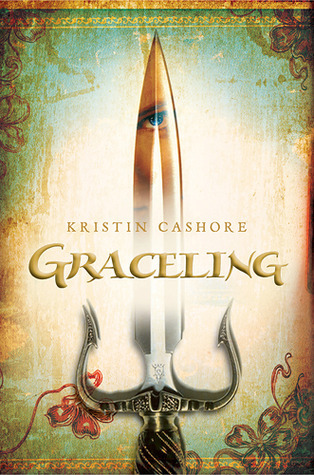 I’ve been hearing good things about Graceling for a while. People I trust have enjoyed it, so I went in expecting a good book. Instead I got a fantastic book. In the world of Katsa, some people are born with a gift, called a Grace. These people are feared and the ones that have certain gifts are exploited and used. Katsa is one of those people. She is skilled at killing and her uncle the king takes advantage of her to get rid of people he views as problems. Unbeknownst to him, she is working with a group of people, the Council, towards a more peaceful world. In one of the Council’s missions, she meets Po. Neither of them is ready for how their lives will intertwine from that first meeting. Katsa is an extremely strong character, especially once she stands up for herself against the king. She’s an amazing fighter, but it’s more than that. She wants a different world than the one she’s living in and she works towards that goal, even though she knows it’s risky. She doesn’t want to live in a world where people are feared for their gifts, or a world where a minor disagreement results in death. Once she meets Po, she sees that she can take even more control of her own fate and once she does, she continues to grow as a person. Po is one of my new favorite love interests. He loves Katsa so fully, and he loves every piece of her. He knows that she isn’t the usual type of girl and he loves and accepts that about her. He accepts that their relationship may never be a normal one, but that’s a piece of her that he loves. As long as she comes back to him, he is willing to love her any way she will allow. Their relationship starts out complicated and unique, but it grows into something consuming and beautiful. The plot and action of the novel are extremely well written. The world is thought out and built beautifully. I could visualize every piece of the land Katsa travelled and I could feel the seasons on my skin. The fight scenes aren’t gratuitously violent or gory; they detail the fight enough I could see what was happening but not to the point where I would see the blood and gore. The story was wrapped up nicely, but there was definitely room for more, and I’ll definitely be reading the rest of the series. Graceling lived up to my expectations and then some. It had everything I look for in a novel. It made my heart beat faster; there was action and development, and a complete storyline. Cashore has written an excellent novel and I can’t wait to see where she takes me next. This entry was posted in Something a Little Different, The Must Reads, Young (and New) Adult and tagged Fantasy, Kristin Cashore, Must-Reads, Young Adult.